Morphiis Reviews - A Good Night's Sleep? 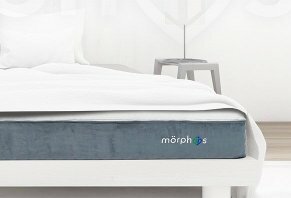 The Morphiis mattress utilizes a series of three firmness inserts to help you adjust the firmness of your bed to match your body type, height and firmness preference. Morphiis is a mattress company based in Aventura, FL, who sells mattresses that have 36 firmness inserts you use to tailor your side of the bed to the specific firmness level you prefer. Most mattresses either have no way to adjust the firmness of their bed and those that do have the option of adjusted firmness tend to be pricey—Sleep Number beds can cost more than $5,599. We interviewed Morphiis founder Earl Takefman to get a sense of why the company started. Takefman told us, previous to Morphiis, he led Perfect Pressure, a company that sold mattress toppers. The idea to create a mattress with adjustable firmness on both sides of the bed came about via the average nightly routine most couples experience. Husband and wife rarely have the same height or body weight and, consequently, they have differing firmness needs. “My wife and I could never agree on a firmness and we never had a mattress we both liked. And that’s what caused me to invent this,” Takefman. The result is the Morphiis, a product which we tested after Takefman sent us a queen-sized mattress for testing. In this review, we’re going to give you a top-to-bottom review of our experience with the free mattress Morphiis sent us, including pricing, the delivery process, setup, smell and other key factors. My wife and I tested a queen-sized Morphiis mattress with the Perfect Pressure topper. I am 6’5” and 280 pounds, while my wife is 5’6” and 133 pounds. The Morphiis replaced an old coil mattress my in-laws gave us. The mattress was sagging on my side of the bed, causing me to inevitably slide toward the edge of the bed. Most mornings, I woke up with back pain. Editor’s note: HighYa does not receive any commission payments from Morphiis. The mattress was sent to us free of charge to test in exchange for our honest review. Morphiis offers two other accessories, too: a pillow and an adjustable frame. The pillows come in queen ($85) and king sizes ($95) and the covers for the pillows are $15 and $17, respectively. The adjustable frame, which allows you to raise and lower parts of your mattress. A twin base is $650, a queen is $850 and a king is $1,300 (two twin bases put together). You can buy legs to raise the frame higher, the Morphiis site says. Shorter legs are $15 and longer legs are $25. Like most online mattress companies, Morphiis gives you 100 days to try your mattress. If you don’t like it, you can return it for a 100% refund, Morphiis says. They’ll send someone out to pick up the mattress for you. 1. “Visible indentations” of more than 1.25” deep when nobody is laying on the bed, provided you haven’t modified the mattress in any way. Also, the terms and conditions point out that the warranty only applies if you are the original owner of the mattress and you bought it directly from Morphiis or an authorized seller. They go on to say that the warranty doesn’t cover damage that’s the result of normal wear and tear, cosmetic flaws, smells, “dampness or mold”, stains, allergies and other situations. It’s important for you to read through this so you can understand what the limitations are. Perhaps the most important limitation on the warranty is that you have to use a foundation that isn't flat when someone is on the bed. In other words, if your box spring, slats or adjustable base are bending under the weight of the people sleeping on the mattress, then these circumstances void your warranty. Based on this final requirement, we believe it’s wise to invest in a solid foundation so you don't’ disqualify yourself from the benefits of the warranty. My wife and I were on vacation when the mattress was supposed to be delivered, so we had FedEx drop it off at their distribution center. When I arrived at the distribution center to pick it up, I noticed it right away. The mattress was leaning up against one of their storage rooms. The mattress was rolled up lengthwise (more than 6’ high) in a blue bag with the Morphiis logo on the side. It weighed more than 50 pounds, which means I had to use a cart to wheel it out to my minivan. If you can’t be at home to receive the mattress, you’ll have to pick it up, so make sure you have enough room in the car to bring the mattress home. Based on my experience, it can fit in a minivan with the back row folded down. The mattress topper was in a box and the pillow was in a small blue bag similar in color and style to the mattress bag. I noticed that the top of mattress bag was partially torn, which was most likely the fault of FedEx. The mattress wasn’t harmed, though. What we liked about the Morphiis setup process is they provide a booklet that gives you advice on how to prepare your mattress for the first night’s sleep. They offer a video online to show you how to unpack your mattress, as well as a diagram in the booklet. Basically, you slide the mattress out carefully, use a Morphiis-provided cutting tool to cut through the thick plastic surrounding the mattress and then you unroll it on your foundation (box spring, slats, etc.). Out of the bag, the mattress has medium inserts (blue). Included in the mattress packaging are two bags: one with soft inserts (yellow) and one with firm inserts (light blue). You get 12 of each firmness for full/queen/king mattresses and 6 of each firmness for twin and twin XL. You get 36 inserts overall – 12 soft, 12 medium and 12 firm. These inserts are what you use to adjust the firmness of your mattress according to your height and weight. The booklet included with the mattress has two pages that provide suggestions for firmness combinations according to height and shoulder/lumbar/hip support. Their website also has a quick quiz you can complete to determine how to configure your firmness inserts. Overall, it took about 10 minutes to roll out the mattress. It had a strong odor, as is often the case with foam-based mattresses, so we stored it in our extra room to let it air out for a night before we slept on it. For the next few days, there was a strong odor in the room. Once we had the bed unpacked, I love the cover. It combines a white top with grey sides and an embroidered Morphiis logo. The mattress top has dimples, whereas the sides are a suede-style material. The matters itself is split into three layers. The top layer has two rectangle sections in it where you put the inserts. These sections are confined within the perimeter of the mattress with ample space between the inserts and the edge of the bed. The remaining two layers provide base support for the top layer. According to Morphiis, all three layers are made of Ultrafoam, an alternative to memory foam called "high-rebound polyurethane.” In general, polyurethane is a durable material that is, in theory, less likely to break down over time and exhibit a big indentation where you normally sleep. According to the company, Ultrafoam sleeps cool, doesn’t sink in when you put pressure on it and doesn’t leave a body impression when you get out of bed. As we mentioned earlier, the mattress comes out of the box with inserts of medium firmness. We left them in, mainly because we were excited about unpacking the mattress and getting the cover on to see how it looked on our bed. The combination of the topper and the medium inserts provided what I would consider medium-firm. Previous to the coil mattress we slept on, my wife and I slept on a Morgedal memory foam mattress from IKEA, which is a firm bed that we really enjoyed. As best as I can remember, our Morphiis felt similar to the firmness of the IKEA mattress. However, the Morphiis looked much better than the IKEA mattress and it didn’t sink in as much as the IKEA mattress did. What I loved about it, being the bigger person that I am, is that the Morphiis didn’t compress at the edge where I tend to sleep. It maintained support all the way out to the edge. Being a side sleeper, this was a huge plus. And, within a few days, the upper-back pain that I felt on the previous mattress disappeared and I haven’t had a sore back since. I can honestly say that this is the most comfortable mattress I’ve ever slept on. Both my wife and I have said to each other that we sleep better with this mattress. In fact, the bed is so comfortable that I find excuses to lay on it. The first few minutes of crawling into bed are my favorite because the comfort the mattress and the topper provide is incredibly relaxing. If there’s one drawback to switching from a coil mattress to a foam mattress, it’s that, in the first few days, the Morphiis slept hotter than our previous bed. There were a couple of nights I woke up sweating even though our thermostat was set at the same setting it was when we didn't’ have the mattress. However, after the first few weeks, the sweating stopped and we didn’t have any more issues with temperature. Based on my personal experience and research about Morphiis, I believe there are some clear takeaways. First, the Morphiis mattress and mattress topper are supremely comfortable. I feel refreshed when I wake up and I don’t experience any of the back pain I felt sleeping on a coil mattress. Never before have I had a bed that made we want to take a five-minute break specifically to lay on it for pleasure and not because I was exhausted. Second, the inserts were a double-edged sword for my wife and I. The downside is that they take up a lot of space. Of course, if you have an attic, then you don’t have to worry about allotting storage space for the inserts. The upside is that, because we didn’t use any of the soft and firm inserts – 22 in all – we've basically got two new beds. Should we feel like the foam inserts currently in the mattress wear out to the point that we aren’t comfortable, we don’t have to buy a new mattress. We can just pull out the medium inserts in their now and replace them with firm inserts, soft ones or a combination of both. For this reason, I believe that the Morphiis mattress offers solid value, particularly when you compare it to other adjustable-firmness mattresses. While Tuft and Needle is considerably cheaper than all the other mattresses on this list, you have to keep in mind that it doesn’t allow for adjustable firmness. In general, we believe that the Morphiis mattress offers good value for those who want an adjustable-firmness mattress. If you aren’t convinced that Morphiis is right for you, then take a few minutes to read through our buying guide for bed-in-a-box mattresses. In the guide, we discuss 11 mattress companies including Tuft and Needle, Purple, Casper and Saatva. Write a Review for Morphiis!